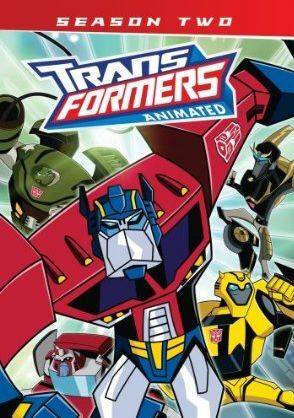 The first season of Transformers Animated turned out to be quite a pleasant surprise. It successfully combined action with humor, gave us interesting characters, introduced human bad guys, and provided an overall story arc. It was a great entry into the whole Transformers universe, and I eagerly awaited season two. And now it's here! Thankfully, the second season continues to have everything that made the first season so good, and it picks up right where season one left off. The Autobots human friend, Sari, is now in charge of her father's company since he became lost during the fierce battle with Megatron. The CEO, a man named Porter C. Powell, is none to happy with this arrangement, and schemes to take control. Meanwhile, Megatron is still alive, as are his loyal Decepticon followers, though now they reside deep underground, hidden from view, planning their return. Starscream returns as well, though now he's doing his own thing. Sweet, as now the Autobots and Decepticons both have a third party to worry about. And this time around, Starscream gets a new, surprising ability that actually makes him a contender! It's also great to see many new transformers introduced this season, both good and bad. Almost all will be recognizable to Generation One fans, though like the first season characters, these have been tweaked to fit the new series. Some of the new guys include Wreck-Gar, the Constructicons, Shockwave, and yes, even Omega Supreme. Oh, and guess who happens to be doing the voice for Wreck-Gar... "Weird Al" Yankovic! "Weird Al" and Transformer fans may recall that Al's original song Dare To Be Stupid was featured in Transformers: The Movie when the Autobots had their first encounter with Wreck-Gar and his fellow Junkions. Also making an appearance is one of my personal favorites, who also made his debut in Transformers: The Movie... Blur! He's still super quick, and still doesn't play a major role, but it's good to see him back in action. Overall, most of the episodes are pretty good. As with any show, some episodes are better than others, but there were only one or two that I didn't really enjoy. And I loved the two-part cliffhanger ending A Bridge Too Close . Can't wait to see what season three holds!